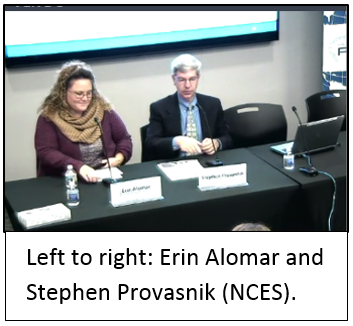 On November 15, 2016, AIR hosted “Highlights from the U.S. PIAAC Survey of Incarcerated Adults: Their Skills, Work Experience, Education, and Training,” a 2-hour event about the findings from the new prison report released by the National Center for Education Statistics (NCES). More than 40 people attended the event in person and over 100 people watched the live webcast. NCES U.S. PIAAC Technical Advisor Stephen Provasnik opened the event with a presentation of the key findings. Afterwards former inmate Erin Alomar talked about her educational and training experience in a U.S. prison. Expert panelists followed with an exploration of incarcerated adult skills and education and training in prisons. The PIAAC U.S. Prison Study is designed to provide data on the skills of incarcerated adults that will be useful to correctional researchers, administrators, and policymakers who develop correctional educational and training policies and programs. The findings in the report provide information about the basic skills of adults incarcerated in U.S. federal and state prisons and how their literacy and numeracy skills compare with those of the U.S. household population. In addition, the findings provide insight into the relationships between skills, education, and job training, as well as between skills and nonacademic experiences in prison, such as work assignments. The release of the report was complemented by the release of an interactive web portal, data files, and extensive web-based search tools that will enable researchers to conduct in-depth secondary analyses. To download the PowerPoint slides from the release event and read the Acting NCES Commissioner’s statement, click here. To view a recording of the release event webcast, click here. AIR staff asked Steve Steurer, Reentry/Education Advocate at CURE National, and John Linton, former Director of the Office of Correctional Education in the Office of Career, Technical, and Adult Education (OCTAE), to answer some questions about the PIAAC U.S. Prison Study and report. Below is an excerpt from their responses. You can read the full Q&A on the PIAAC Gateway [link]. 1. What do you think are the implications of the PIAAC U.S. Prison Study on education and training programs and policies in U.S. prisons? Steve: The PIAAC Prison Study demonstrates the significant divide between the average adult American and the incarcerated person in terms of literacy, numeracy, and digital skills. When you look at this information in conjunction with the overall lack of educational programs currently available in most prisons, one can really appreciate that we need to do more to educate this population. The PIAAC study recommendations, coupled with the RAND study on the positive impact of correctional education on recidivism reduction, provide a clear mandate for us to do something to improve correctional education programs. (See How Effective Is Correctional Education and Where Do We Go From Here? The RAND Corporation.) We should use these two studies as benchmarks to advocate for changes in correctional policy and practice at all levels: jails, state prisons, and federal prisons. 2. 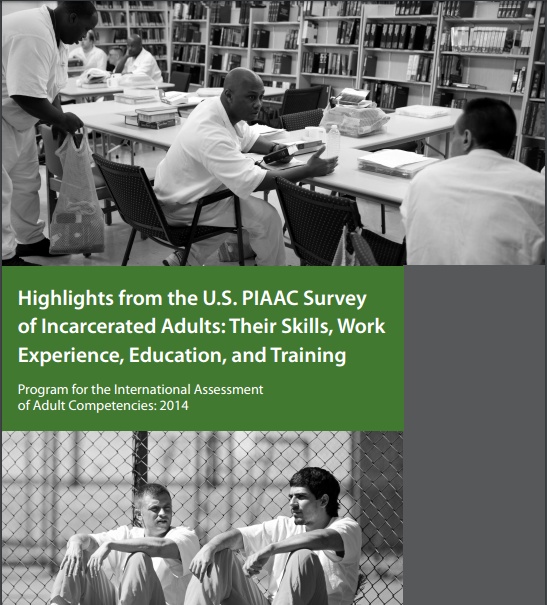 What do you think is the most interesting or significant finding from the report Highlights from the U.S. PIAAC Survey of Incarcerated Adults: Their Skills, Work Experience, Education, and Training? Why? John: I would emphasize three findings. First, I note the lower level of educational attainment by incarcerated persons in comparison to our nonincarcerated population. Secondly, although the incarcerated population had lower average literacy and numeracy scores than the U.S. household population, the skill levels of the incarcerated (with the notable exception of numeracy skills) correlate with their educational attainment levels. In other words, incarcerated high school drop-outs and incarcerated high school graduates demonstrate performance levels roughly equivalent to nonincarcerated persons with the same level of formal education. This speaks to the capability of those incarcerated to benefit from opportunities to increase their educational attainment. In the third place, and I think most importantly, is the finding that incarcerated persons overwhelmingly aspire to advance their education; they want to improve their skills and to attain educational credentials. This finding confirms my own experience-informed belief and stands in stark contrast to media-inspired negative stereotypes of the incarcerated. 3. Does anything in the report surprise you? 4. How have education and training programs in U.S. prisons changed over the past 10–15 years? Steve: Unfortunately, education and training programs have not generally improved. In fact, the RAND correctional education impact studies underline how state and federal education funding has shrunk significantly since the 2007 recession. Because Congress mandated federal cuts in general, the decline continues. Federal adult education and career development funding is less than it was 10 or 15 years ago. With the exception of certain states (like Georgia and California), state budgets have shrunk as well. 5. How can researchers, educators, and practitioners use the PIAAC U.S. Prison Study to further their work in the prison system? John: We need to recognize that the “highlights” report is exactly that—a compilation of some highlights from the rich datasets that constitute the PIAAC prison study. The individually administered background questionnaire, somewhat different than the background questionnaire administered to the nonincarcerated, offers extensive information. The publicly available data portal provides researchers with virtually limitless options to look at correlations between the factors identified in the questionnaire and performance levels. 6. What do you see as the biggest gap in research related to education and training programs in prisons? How can the PIAAC prison data help to bridge this gap? 7. What additional research is needed to understand the skills of U.S. inmates and their experiences with education and training programs? What proportion of low-skill employees had to fund the cost of their job-related training themselves? 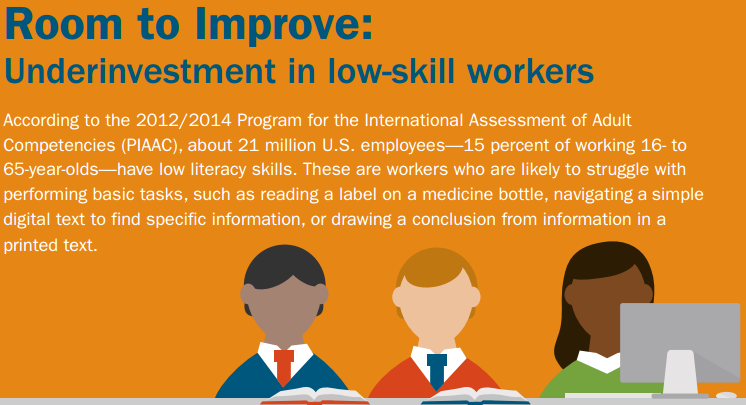 Learn more through this new infographic. The percentage of adults with native-born and foreign-born parents, by educational attainment. Intergenerational mobility in education, by parents’ educational attainment and immigrant status. The field of education studied among tertiary-educated adults, by gender. Employment rates of tertiary-educated adults, by field of education studied and gender. The proficiency, use, and need of information and communication technologies at work, by main industry. Participation in formal and/or nonformal education, by gender, literacy proficiency level, and index of readiness to learn. See the full report for findings on topics such as the extent to which parents’ background influences educational attainment, how educational attainment affects participation in the labor market, participation in education and learning, and how social outcomes are related to education and skills. The OECD, in collaboration with the Spanish Ministry of Education, Culture, and Sport and the Government of the Community of Madrid, held the Third PIAAC International Conference in Madrid, Spain, on November 6–8, 2016. The conference was attended primarily by researchers and policymakers and focused on research that used PIAAC data to address a variety of relevant policy issues. The presentations, including one by AIR PIAAC staff member Emily Pawlowski, addressed health inequalities and skills, the effects of upper secondary education and training systems on skills, immigrant skills and labor market outcomes, and teacher cognitive skills and student performance. Speakers also discussed the future of PIAAC and how PIAAC data can contribute to policymaking. Papers and presentations from the conference are available on the conference page. Nearly half of U.S. adults ages 66–74 with only “fair” health status performed at PIAAC’s lowest proficiency levels—Level 1 or below—in literacy. Conversely, less than 20% of U.S. adults ages 66–74 with “excellent” health performed at the lowest proficiency levels. Read the updated PIAAC First Look report to learn more. U.S. PIAAC Interactive Data Portal: Choose Prison 18–74 in the Select Sample drop-down list. International Data Explorer: Choose U.S. Adults, 16–74 (household and prison) in the Display drop-down list. 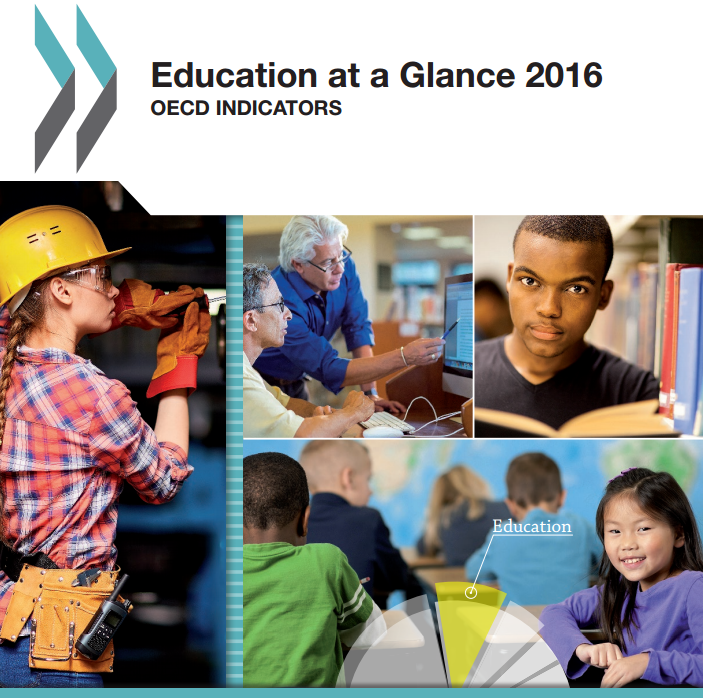 The Organization for Economic Cooperation and Development (OECD) has developed a series of four short reports called Adult Skills in Focus. The reports cover digital skills; low literacy proficiency; the relationship between age and skills; and the relationship between education, literacy, and self-reported health. Look for these reports on the Outreach Toolkit page: http://piaacgateway.com/toolkit-docs. Numeracy Skill Levels of First Generation and Multi Generation College Graduates by Karly Ford and Mark Umbricht.